Track Albatross Across the Pacific! Albatross are beautiful and far ranging seabirds. They travel thousands of miles to search for food and feed their chicks. For instance, Black-footed Albatross (Phoebastria nigripes) breeding on Tern Island, Hawaii (23.87 ° N, 166.29 ° W), commute over 9000 km round-trip to the California Current System (34 - 48 ° N, 115 – 130 ° W), where they search for food in waters along the central California continental shelf and slope. Although scientists know that Black-footed Albatross make this long journey when feeding their chicks, they know little about their behaviors and the paths that they take after they leave the island colonies. Where do they spend their time? Where do they eat? How do they use the wind? In which areas can albatross get caught up by dangerous fishing lines? Some areas off California are important fishing grounds, places where commercial fisheries catch the fish we eat at home and in restaurants. To catch oceanic fish, including swordfish and tuna, fishers set ‘longlines’, huge fishing lines equipped with thousands of hooks and reaching up to 60 miles behind the boat. Albatrosses are attracted to the bait on these hooks, get caught on the lines when they are deployed from the surface, resulting in drowning. Each year, hundreds of thousands of seabirds are killed accidentally by fisheries worldwide, a problem called 'by-catch'. Scientists are trying to answer these research questions, and to help prevent unnecessary albatross deaths. 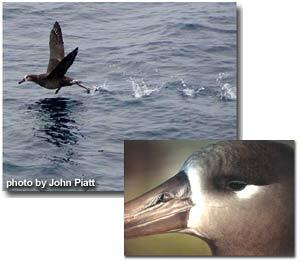 Starting in 2004, the Albatross Exploration and Conservation CollaborativeOikonos, Duke University, the Claremont Colleges, Moss Landing Marine Laboratorieshas tagged Black-footed Albatross within the Cordell Bank National Marine Sanctuary in California, and tracked their summer – fall movements (July – October) using satellite tags. During this study, the scientists tracked nine birds, two of which traveled all the way from California to Japan in less than 2 months! The researchers learned more about where the birds spend their time at sea and how they move across the Pacific. Nine more birds tagged in July 2005 will be tracked for up to 60 days. Cordell, the most motivated bird to date, traveled an impressive 5,000 kilometers (over 3,100 miles) in the first 16 days after his release! To follow the paths of this most recent migration, keep checking the Signals of Spring website. Learn alongside the scientists, and help to save the albatross!